Der Artikel Neale Donald Walsch: What God Said wurde in den Warenkorb gelegt. Ihr Warenkorb enthält nun 1 Artikel im Wert von EUR 11,70. With over 2 million copies sold and translations in 37 languages, Neale Donald Walsch's 'Conversations with God' is a phenomenon. Seventeen years later, his fans are still hungry for more of the wisdom Walsch has gleaned from his personal chats with God. 'What God Said' contains all that we need to know about life - just the essentials, in one peaceful message, straight from God herself. 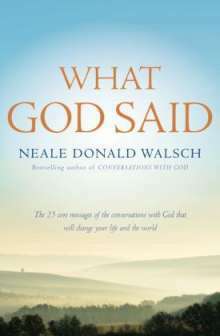 Inspired by his nine-book Conversations with God series, many people have asked Neale Donald Walsch to find a way to deliver the most essential pieces of God's message in a more succinct way.